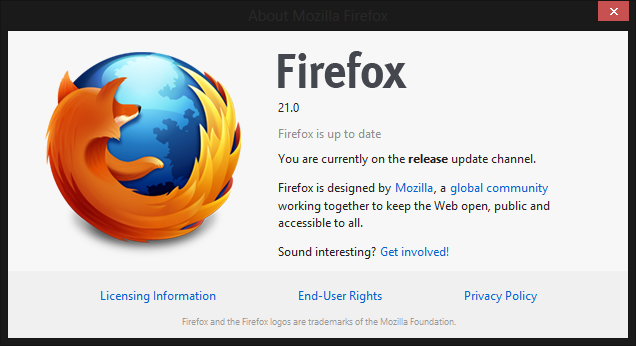 Mozilla has launched Firefox 21 for Mac, Windows, and Linux, adding a number of improvements, namely to the browser's Social API. "Today, we are adding multiple new social providers Cliqz, Mixi and msnNOW to Firefox," wrote Mozilla in a blog post today. The browser first added Facebook integration back in December, and the inclusion of these services goes a long way towards making social integration an even larger part of the services offered. The Do Not Track feature has been part of Firefox for some time now. You can enable it to add information to each connection request to tell sites about your tracking preference. Along with adding more social integration, the release also closed up security holes in the browser rated as high in severity, including two in the Mozilla Maintenance Service although only one of them left the browser open to potential remote exploits. Meanwhile, the Firefox for Android mobile browser will be updated to improve support for the HTML5 platform. Firefox for Android comes with the custom open source fonts Charis and Open Sans. They will replace the default Android fonts for what Mozilla claims is a more visually appealing and clear reading experience on the Web. Users are advised to upgrade as soon as possible. If you have configured automatic updates, you should not have to worry about that though as your browser will get updated automatically when you start it after the update becomes available.